Before I put on a trenchcoat and fight some conspiracies, another interlude. Today I was in the vicinity of one of those motion simulator rides — that is, a movie screen and chairs that tilt up and down and sometimes things that blow air at you to simulate the rushing of wind. I had never tried such a thing before, and since they had a dinosaur-themed show, I felt that I had to try it in the name of further research. Emily Short posted about her experiences with rides of this sort at a theme park a few months back, but I get the impression that the theme-park strain of ride is higher-budget than the urban tourist-trap variety. I actually experienced two “rides” using the same hardware. The first was an exaggerated log ride down a river in the mountains, essentially just a virtualized roller coaster; the second was more narrative, sending the audience on a perilous journey to Dino Island to airlift out the last remaining male tyrannosaurus before the island explodes. (This is definitely a medium aimed at children, and so, to comply with current mores, dinosaurs aren’t things to be shot like they were in Dino Crisis. After all, if we can keep gun violence out of children’s media, kids will learn that it’s a grown-up thing, to be looked forward to, just like binge drinking.) I honestly thought the straightforwardness of the log ride worked better: it let me experience the physical sensations without worrying about why things were happening or what it meant for the mission. Both were preceded by a cheesy mock-serious intro that put me in mind of Saturday morning TV. That’s about what I was expecting from the experience, I suppose: cheesiness and gimmickry. And at some point, I realized: These rides are a close relative of the 90s FMV game. Seriously, both forms are essentially movies made novel by technological gimmickry (which, in turn, is expected to make the audience forgiving). Once we recognize this kinship, it’s reasonable to speculate that the producers recognized it first — that the motion simulation ride and the FMV game were regarded by their makers as filling the same niche, despite the gamers’ expectation that the latter fill a quite different niche, that of game. Which raises interesting questions: Did “siliwood” even understand that games play a different role in the gamer’s life than theme park rides? Do the captains of the industry understand it even now? And if they don’t… are they wrong? To change tracks abruptly, I recently read Man, Play, and Games by Roger Caillois. I honestly don’t recommend it — although it’s part of the canon of ludology, it doesn’t really have much to say that’s relevant to the subject. Apart from an appendix about lottery systems, it mainly just makes unsupported generalizations about games, which are then used as a launching point for the real subject, unsupported generalizations about society. Some of the assertions are even blatantly false — for example, when he says that games heavily based on agon (struggle) and alea (chance) never have, and indeed in principle cannot have, a strong element of mimicry 1Some translations apparently use “mimesis” here. It’s unclear to me which word was used in the original French, given that Caillois deliberately avoids taking his terms from just one language. I use “mimcry” here because “mimesis” has other connotations in the IF community. (assuming alternate roles). We can’t blame him for not predicting Dungeons & Dragons, but it seems bone-headed of him to call it impossible, especially since a little implicit mimicry had been part of hobby wargaming for decades. The main thing of value Caillois provides us with is his conception of, and terminology for, the principles that, according to him, underlie all play. There are four, three of which we’ve just seen: agon, alea, and mimicry. The fourth is ilinx, or vertigo: pleasure in physical loss of control. It’s at this point that the student of games balks, but in fact he’s not really talking about games here. He’s talking about play, a much broader category, stretching from the undirected frolicking of children to crossword puzzles to dancing — even, if you want to really stretch it (and Caillois does), to theatrical productions. Ilinx is present in the play of children as they swing on swings or slide on slides or even just spin around and get dizzy; it plays a lesser role in the play of grown-ups, but is claimed to be behind the appeal of alcohol and other drugs. But there’s one place where ilinx is available to people of all ages: carnival rides. Now, Caillois makes much of a supposed alliance of agon and alea, hostile to the mimicry/ilinx axis. I’ve already expressed some skepticism about this schema, but looking at the history of gimmick movies makes it temptingly plausible. For what is an interactive movie but a movie with elements of agon? And what is a motion simulator ride but a movie with elements of ilinx? To the extent that they fill the same niche — which they probably do in the ecology of Hollywood, if not in our hearts — the latter has supplanted the former. To Caillois, that’s a step backward. And for once, I’m inclined to agree with him. The interactive movie was an overhyped dumbing-down of gaming, an attempt to make the unruly new artform fit better into established production pipelines, but I can’t help but feel that it was also an experiment that never fulfilled its potential. The simulated motion ride bears a similar relationship to the actual motion ride (that is, the roller coaster and its ilk): it’s an inferior experience in a lot of ways, but I can imagine it becoming superior as the technology advances. But I don’t go on roller coasters regularly, 2Except in the sense that I take a bus through San Francisco to get to work. and I probably wouldn’t even if they were more available. And I think most people are with me there. That’s why we see them in special set-apart places like fairgrounds and amusement parks that people go to only occasionally. 1. ↑ Some translations apparently use “mimesis” here. It’s unclear to me which word was used in the original French, given that Caillois deliberately avoids taking his terms from just one language. I use “mimcry” here because “mimesis” has other connotations in the IF community. 2. ↑ Except in the sense that I take a bus through San Francisco to get to work. But who said the notion was laughable? I come from text adventures; I had known ever since The Lurking Horror how interactivity could heighten a sense of fear even in cliché situations. Moreover, the awkward controls were probably less effective on the PC, because to a PC gamer, awkward controls were the norm. Even back then — especially back then — the lower barriers to entry and complete lack of enforceable standards meant that PCs were friendlier to experimentation on the part of game designers, for good and for ill. Finally, it’s always seemed to me that RE severely undercut the horror element by making the player character part of an elite special-tactics police team, and therefore already more prepared than most to deal with a zombie uprising. 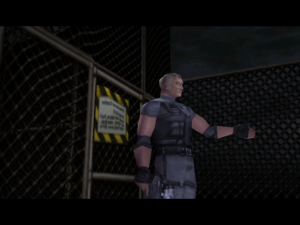 To console gamers at the time, this may have been unremarkable; console games were mainly action games, which tended to have highly-trained, technologically-augmented, or even outright superhuman protagonists, to both justify how you could singlehandedly defeat scores of computer-controlled enemies and to appeal to the target audience’s power fantasies. Again, I was a fan of adventure games, which are more given to everyman heroes. But adventure games have never been big on consoles. 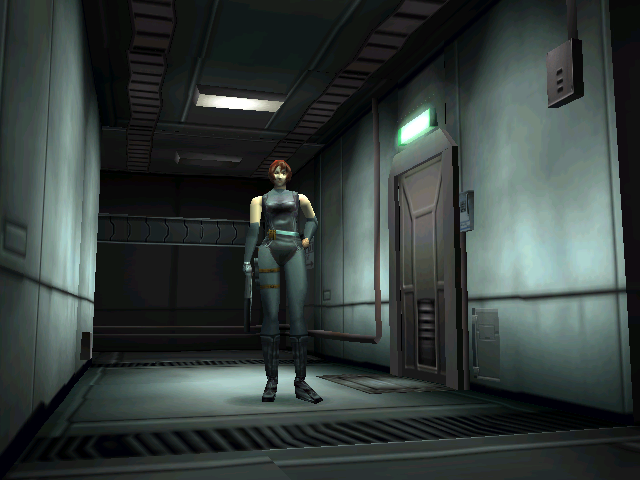 So, how does all this relate to Dino Crisis? For starters, it carries the highly-trained player character part even farther. You’re military this time, part of a G.I. Joe-like special-forces team, sent to extract a scientist from a secret laboratory on a remote island. The intro cutscene shows you parachuting onto the island with a kind of gee-whiz feel, clearly aimed at kind of kid who doodles tanks in his notebook. This is horror? Well, maybe it’s not. Those subversions of expectation that Bissel described as contributing to the sense of fear? The designers of Dino Crisis seem to have generally regarded them as flaws, and removed them. This time, you can walk around with your gun drawn. Abrupt changes of camera angle still exist, but to a much lesser degree: unlike RE, DC is in a fully 3D-rendered environment, which allows the camera to move smoothly with you. The gun seems to auto-aim, or perhaps it’s just that the dinosaurs are big enough (and, whenever I encounter one, close enough) to be hard to miss. Either way, it makes the lack of aiming aids unimportant. The movement controls are still as awkward as non-camera-relative directional movement always is, but that’s as far as it goes for interfering with convention. It’s still a blatant RE imitation, but it’s as if Capcom decided that the way forward, the way to make the genre to appeal to more people, was to play it safe and make it more like a typical console game. Meanwhile, I’m approaching it from the opposite direction, so it seems like a step backward. 1. ↑ In this chapter, Bissell makes the odd choice of describing his own experiences in the second person. It’s especially weird if, like me, your actual experiences with the game are completely unlike his. Not a lot of time to post today, and not a lot of play-time to post about, so I’ll just briefly introduce our next item. 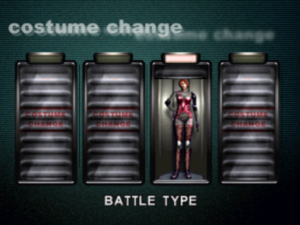 Dino Crisis is another one of those games with an easily-stated high concept: it’s Resident Evil with dinosaurs instead of zombies. I’m playing the PC version, but it’s blatantly a port from the original Playstation. A surprisingly robust one, too. I’ve more or less skipped past the PC’s first fumbling contacts with 3D graphics hardware here. 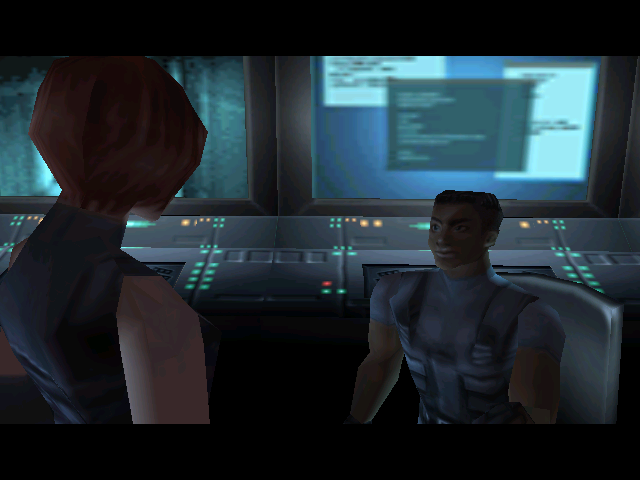 By 1999, Direct3D was on solid enough ground that the game works effortlessly on my current system, albeit at a maximum resolution of 640×480. However solid their foundations, though, the 3D objects themselves are quite wobbly, especially when the camera is pitched at an oblique angle, as happens a lot in Resident Evil imitators. But I’ll tack this up to faithfulness to the original experience. The survival horror genre, like the rhythm game, is primarily a console phenomenon. There really aren’t any survival horror games native to PC other than proto-example Alone in the Dark, which is sort of like the genre’s Pete Best, a franchise that left before the genre became famous. As such, I think I felt almost obliged at the time to pick up what few PC ports there were, once they became cheap. It wasn’t until Silent Hill 2 that I found one that I unreservedly liked. Resident Evil itself confounded me: here it was, staggeringly popular, and I couldn’t for the life of me figure out why. 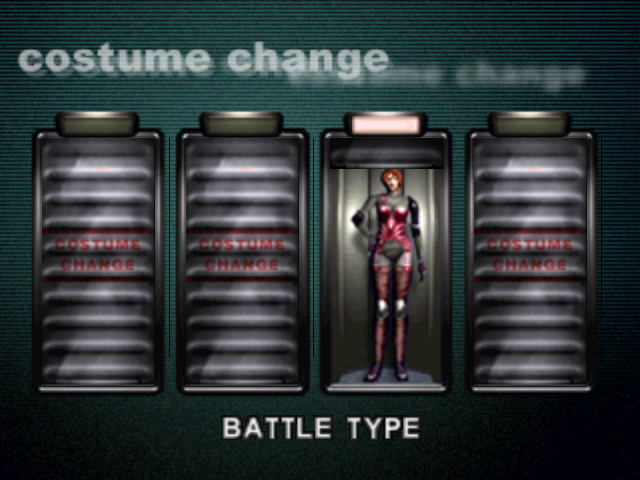 When I bought Dino Crisis, it was in part in the hope that another data point would help me to understand. This is a point I’ll return to. One other thing: I don’t like to talk about my professional life on this blog, but readers who know me will recognize that choosing this game at this time was really no choice at all. Playing this game is essential research.